Our customers and community members are the number one reason we are in businesss. We will do anything we can for our customers. We are happy when we can make a difference in their lives. Thank you to everyone who has shared their stories with us. Here are a few, we hope you enjoy them. Read our reviews on Reverb! Visit our renverb site and order from our on-line store! Mike and Joe and the Guild guitar. Thank You for being interested in hearing the story behind the guitar! Back in the late 80's when I was playing gigs and writing songs, I decided to start recording my songs on a Fostex 4 track cassette recorder. (Which, by the way, I still have!). I came to your music store when it was owned and run by Bob. I wanted to get an electric guitar to add some effects to certain songs. Bob had just gotten in this Guild guitar and he sold it to me for $75.00. The first thing I remember about this guitar was that it was very difficult keeping it in tune. Any slight nudge and it would go out. But I really liked the sound of the guitar. I used it in 1989 and 1990 on my songs. Then one day a tuning key broke and it has been sitting outside my closet, leaning against the wall, ever since. Then in February of this year, my son Thomas who was playing his bass guitar, decided it was time for an upgrade to a better one. We came to your store to look at left-handed bass guitars. I wanted to do a trade in with Thomas's old bass and this Guild guitar that was just collecting dust. Mike said he really didn't do trades, but if I was interested, I could donate the guitars for a good cause. This was more than fine with me because I really didn't want it sitting around anymore and if someone else could get some pleasure out of it, I was all for it. When Thomas's bass came in, we came and got it and brought the two guitars with us. I didn't notice it, but Thomas did. When we were going out to the car, Thomas told me he saw a couple of guys looking at the Guild that we left. About an hour or so later, I got a call from Mike telling me that this Guild was worth something. When he told me how much, I couldn't believe it. Mike encouraged me to get it fixed up and either sell it or keep it. So I decided to send it out to get it fixed. Now that I have it back and everything works and it stays perfectly in tune, I've decided to keep it. This time in a case, and not leaning outside my closet door against the wall. The most amazing aspect of this story has nothing to do with music or guitars, but the integrity of one person, Mike, who could have easily said nothing and profited from someone who had no idea of what he had. Tonight, Thomas and I came to your store and bought the only left-handed electric guitar you had. We didn't even think about going anywhere else! Chris Grant works on his audition material for School of Rock. 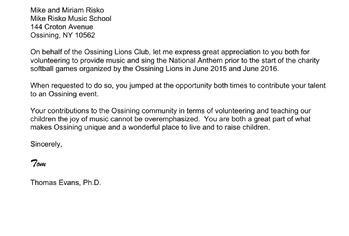 Thank you are 2 words that are not enough for Mike and Miriam Risko. Since my son Christopher started with his drum lessons 4 years ago he has been non stop rocking. Mike and Miriam are so understating and always coming up with new ideas for the children to shine with their singing or instrument. Lessons, Rock Bands for kids and adults , birthday parties musical kid shows, gig nights, and much more..
At this time they have him placed on the callback list and under radar to be ready to go when they call again. 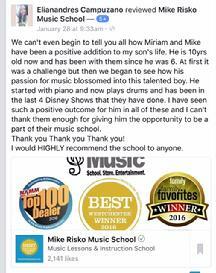 Having my son enrolled as a student at Mike Risko is the best thing we did for him. He continues to grow and shine there. Alena singing at Carnegie Hall. Thank you for being a huge part of my success in my music career. If it were not for your dedication and passion for music, I would have not have discovered my love for music. You have opened my eyes to so many opportunities. You have given me hope and love for music by showing me that even though I am different, I can reach for my dreams. I never thought that music could get me through many obstacles and challenges that I have faced growing up. 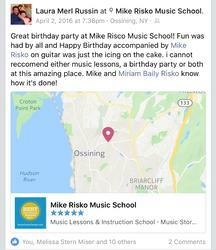 I have attended The Mike Risko Music School, taking various instruments such as violin and piano. In addition, I had taken over ten years of voice lessons. Through all your professional help with awesome teachers and all their enthusiasm,I have continued singing, producing and writing my own music. 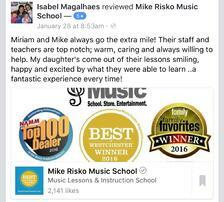 Because of the Mike Risko Music School, I can honestly say that without your guidance, encouragement, and personal attention, I would never have grown as a vocal artist. With the confidence and passion,you have instilled in me early on in my life. Because of you, I have gotten the chance to continually demonstrate my talent even getting a chance to sing on the stage of Carnegie Hall for Florence Foster Jenkins movie trailer starring Meryl Streep. You have given me skills and passion for not only music, but for having the honor to work with you. I learned the music business by working in the music school and music store whenever I had and have the opportunity during school breaks at Quinnipiac University, where I also have my own Radio Show hour singing cover songs and working toward an MBA. You have changed my life in so many ways and you continue to be an inspiration in my life. I hope to keep passing on the change you have brought to my life. I hope to continue to make a difference through music and to show that differences are blessings! Mike and his daughter with Tom Evans from the Lions Club at the Lions Club Baseball game fundraiser.